Written by a highly-skilled practitioner, this practical, classroom-focused guide contains all the support you need to become a great mathematics teacher. Combining a grounded, modern rationale for learning and teaching with highly practical training approaches, the book guides you through the themes of mathematics teaching and the skills needed to demonstrate learning. Teach Now! Mathematics also offers clear, straightforward advice on classroom practice, lesson planning and working in schools. Teaching and learning, planning, assessment and behaviour management are all covered in detail, with a host of carefully chosen examples used to demonstrate good practice. Every example is rooted in recent experience in the mathematics classroom. The commonalities of teaching pedagogy across all subjects are discussed but this book gets to the heart of the unique nature of this subject. From building confidence to developing problem-solving skills and mathematical literacy, this book considers what the keys to success are in learning, and hence teaching, mathematics. There are also chapters on dealing with pressure, excelling in observations, finding the right job and succeeding at interview. Throughout the book, there is a great selection of ready-to-use activities, strategies and techniques which will help put you on the fast track to success in the classroom. 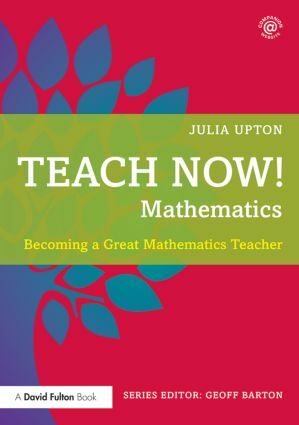 With a strong emphasis on sparking students’ interest and enthusiasm in mathematics, this book is your essential guide as you start your exciting and rewarding career as an outstanding mathematics teacher.